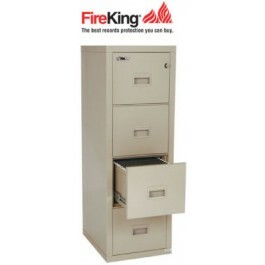 Affordable and made in the USA, the 4 drawer fireproof file cabinet 4R1822-C saves space by being only 22 inches deep. This vertical still has the prestigious UL 1-Hour fireproof rating and comes in parchment color only. Space saving and a best choice for the budget minded, you get a full 1 hour fireproof filing cabinet that will be the best priced online.